MV CMA CGM Copernic for the long voyage from Adelaide to Tilbury. 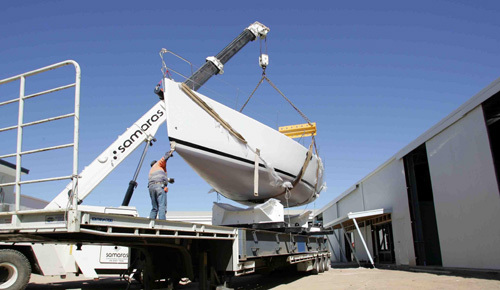 12.75m 7050kg Farr 42 cruiser / racer in their yard at Adelaide. for the racing season - two weeks after delivering her South African mast. 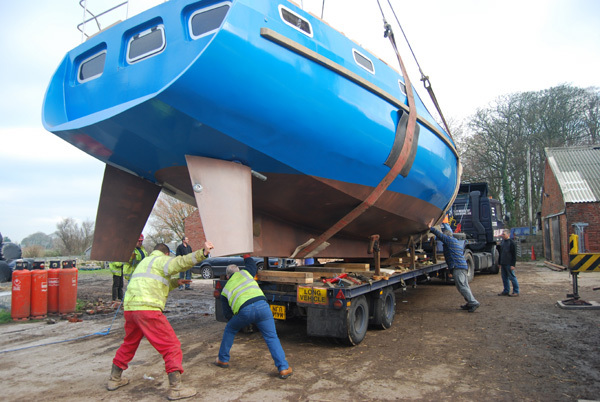 December 2007: HWYL DDA, a new Dudley Dix Little Creek 47 swing keel steel cutter was loaded in a Lancashire farmyard for launching at Preston Marina. 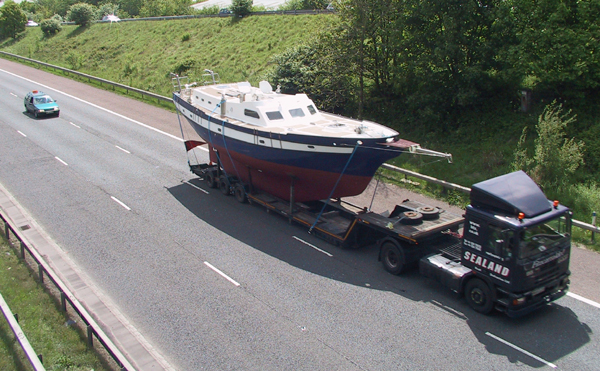 CLICK this picture for boat transport news from 2006. Crossing the Highlands in 2007. Cygnus Cyfish 33 en route from Ullapool to Essex. June 2007: Otterbank, the 32ft wooden motor sailer that once served as the floating bank of the Northern Isles, is back in the Orkneys after thirty years. Her former bank manager, Willie Groat, now 86, watched her arrive by the light of the midnight sun after a successful public campaign to bring her back to the islands she once served. 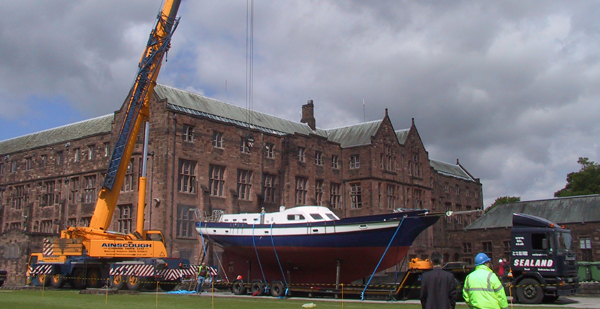 May 2007: After nine years building at Bolton School, England, this 14.6m ferro-concrete ketch was in one day lifted, transported to the coast and launched at Glasson Dock, near Lancaster. A thousand schoolboys worked on the design, construction and fit-out of Tenacity of Bolton. Schoolmaster Mike Whitmarsh led the project. He will skipper the yacht during his retirement years. Ainscough Crane Hire, one of many firms who helped the project, organised the 26 tonne lift from the schoolyard. Road delivery involved running an ultra-low trailer at 4.94m high on motorways before changing tractor units to lift the trailer bed over two hump-backed bridges on the River Lune saltmarshes. 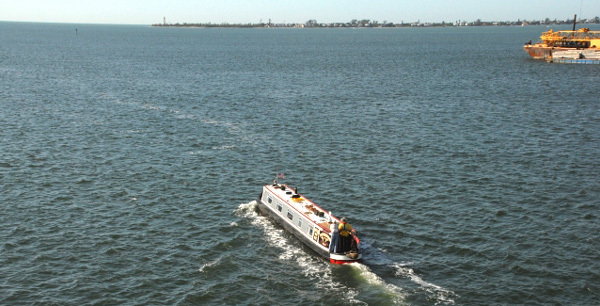 April 2007: Terry and Monica Darlington cruised their well-known 61ft British narrowboat from Virginia to Florida along the Intracoastal Waterway and were pictured from the Sanibel Bridge - sallying out into the Gulf of Mexico. 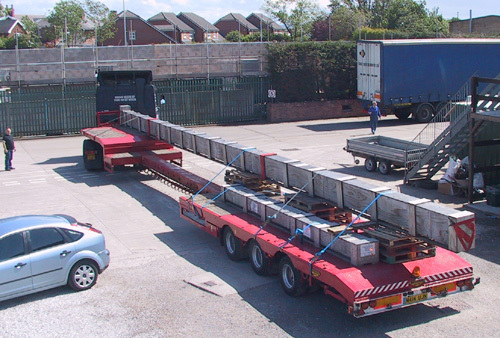 Sealand Boat Deliveries and Morgan Marine organised transport of the record-breaking boat back to Staffordshire, England, by truck, ship and lorry. Here trucker Ken Hall loads the 18 tonne traditional steel narrowboat at the Owl Creek Boatworks, on the Caloosahatchee River, near Alva, Florida, for delivery to the Atlantic Container Line at Portsmouth VA. Best-selling travel writer Terry Darlington is writing about the voyage in a new book - Narrow Dog to Indian River. CLICK here for pictures from Florida photographer Marv. CLICK here for more on Narrow Dog. 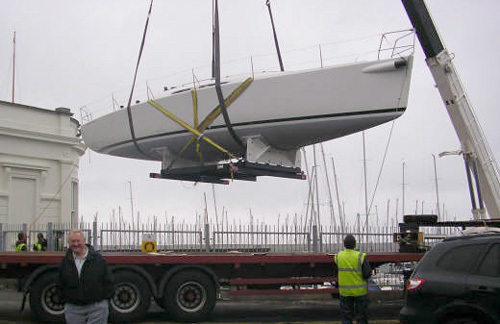 CLICK this picture for yacht transport news from 2006. 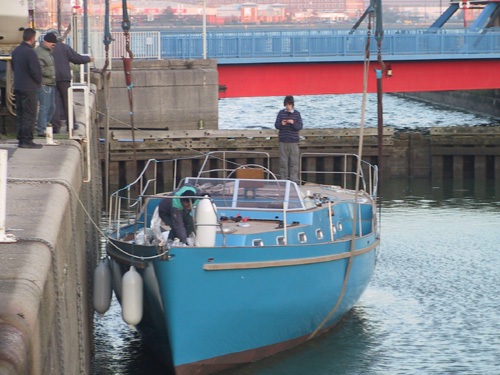 February 2007: Less than a month after slipping her moorings in Key Largo, Florida, this fine Cabo Rico 38 cutter arrived by lorry at Liverpool Marina for handing over to her new owners. A few days after being sold in Florida to English buyers, FRUITION was lifted from the water to a prepared shipping cradle aboard the geared and ice strengthened ship UMIAVUT, bound for Southampton GB. This slick mid-winter move was jointly planned by Sevenstar Yacht Transport, Yacht Shipping in Southampton and Sealand Boat Deliveries in Liverpool. UMIAVUT's captain diverted to avoid bad weather in Mid-Atlantic. The yacht was shipped fully-rigged. She cleared EU customs on the day she arrived and was lifted ashore twelve hours later straight to a road trailer. A Sealand rigger and driver unstepped her mast on the quay at Southampton and road-hauled her to Liverpool. 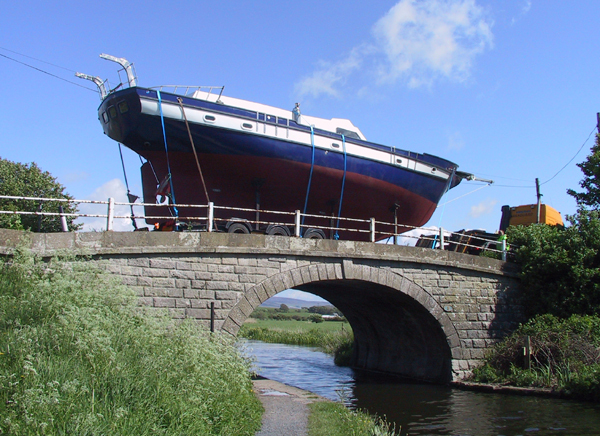 January 2007: To clear British motorway bridges, R.A. Bugler transported the Dutch-built steel Sealion 42 MAYNA, 12.8m x 4.37m 15 tonnes with her keel only 0.025m [ten inches] above the road surface, from Poole to Whitehaven, Cumbria, for launching. 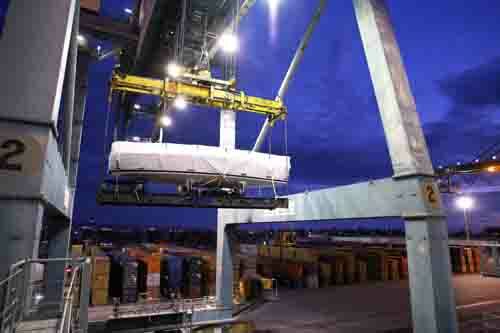 Planning by Sealand Boat Deliveries. To sail is necessary, to survive is not necessary. Attributed by Plutarch to Gnaeus Pompeius who sent sailors to sea in bad weather to bring grain from Africa to Rome. Ici on trouve la metéo, des vendeurs de bateaux, les spécialistes du transport bateau et la cyberbourse électronique des transporteurs. Ein Amerikaner aus Kalifornien war 1997 unser erster Kunde. Er liess seine Yacht in Amerika von Küste zu Küste transportieren. Seit diesem ungewöhnlichen Boottransport, hat unsere Transportbörse hunderte von Yachtbesitizern mit anderen Bootstransporteuren in Verbindung gebracht. Stellen auch sie ihr Transportproblem auf dem BTX board dar. Die Bootstranporteure geben kostenlos Ratschläge und bieten ihnen Preise an.